1. Die cut all four of the tree dies using the First Edition Nesting Tree die set on to different papers from the Dovecraft Christmas Basics 8x8 Paper Pack. 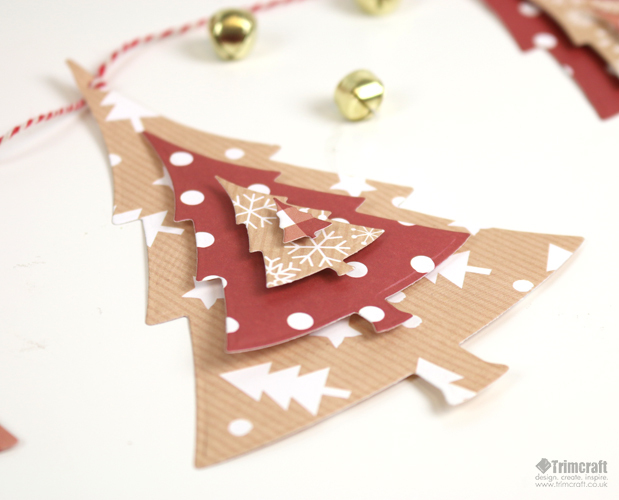 Alternatively, you can print the free template and cut out the trees from a variety of Christmas Basics Papers. 2. Layer the tree shapes together, using 3D foam pads to add dimension. 3. Punch a hole at the top of the largest tree die cut and thread through a length of Dovecraft Twine. 4. Thread the twine through the remaining trees. Make a knot at the top of each tree, to stop the trees from slipping along the twine. There you have it, a handmade garland that will only take ten minutes to make! You could create a selection of garlands using different papercraft collections to make your home look really festive!